Our bungalows “comfort” are comfortable small houses in masonry, perfect for a relaxing holiday. Finishing touches are really painstaking and they have air conditioning/heating (extra charge). Bungalows “comfort” respect environment with their energy conservation system and they have also hot water. The bungalows for 2 people (about 20 sq. m.) consisting in a living room/bedroom with double bed, equipped kitchenette and a toilette (wc, washbasin, bidet and shower). Kitchenette is provided with a gas cooker, fridge, sink and cupboard with kitchenware (pots, plates, glasses, cutlery, etc.). Outside the bungalows there’s a covered terrace (about 10 sq. m.), which offers the chance to relax or eat in open air with table and seats. Parking is nearby the bungalow. Into the bungalow domestic animals are not allowed. Our mobile home is a comfortable caravan, very well furnished, perfect for a holiday in close contact with nature. Because of its dimension (8 meters long and 3 meters wide) is ideal for 4 persons, but it can sleep also 5th person in the living room (equipped with extractable sofa bed). This mobile home is situated on a shaded pitch, just 40 metres away form beach’s exit. It has a living room/kitchenette, one room with double bed and one room with 2 single beds, bathroom with shower and washbasin and toilette with WC and washbasin. Kitchenette has a cooktop with hood, refrigerator, kitchen sink with hot water and is equipped with kitchenware (pots and pans, plates, glasses, cutlery etc). Outside a wide veranda offers chance to relax and eat comfortably on table and chairs in equipment. Mobile home has also air conditioning, which is already included in price. Into the mobil home domestic animals are not allowed. Campsite has 83 pitches, all bounded and numbered, which are of three types: normal inner, sea view and half pitch. Our buttonholes are 24 pitches with sea view: they’re situated just in front of the beach, with a magnificent view on all the coast of Costa Rei and Peppino rock. Because of their peculiarity, not all pitches sea view are shadowed. All pitches have 2 Amp. (220 Volt) electric hook-up facility with CEI socket, in accordance with EEC directives. Some of the pitches have a 6 Amp electric hook-up. Just a limited number of pitches can be booked. Car has to be parked onto the pitch. Campsite has 83 pitches, all bounded and numbered, which are of three types: normal inner, sea view and half pitch. The crown jewels of our campsite are the 26 beautiful beachfront pitches. 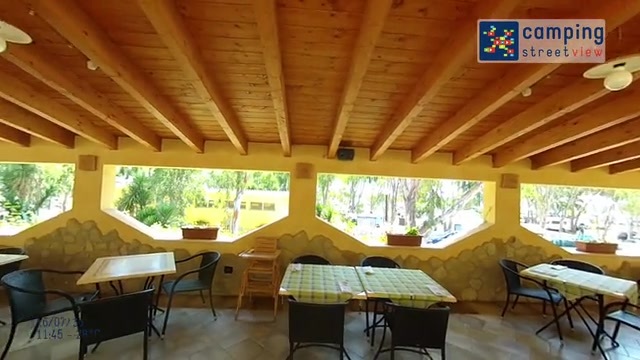 They are located directly in front of the beach, with great views of the coast and the “Scoglio di Peppino”. The location is slightly raised above sea level, giving them a beautiful view and light ventilation. Because of this special and unusual feature, only part of the sites on the seafront are in shade. On seafront pitches, vehicles must be positioned perpendicular to the beach, which also allows the inner pitches to enjoy views of the sea. The pitches can be from 80 to 100 sqm and even have space for large motorhomes and caravans. Access to the beach is made up of three exits, one with wooden walkway that is accessible to wheelchairs. All pitches are equipped with 6 Amp/220 volt current connection and IEC socket complying with European directives, and have a car parking within them or in the vicinity of the space. Motorhomes and caravans equipped with satellite antennas may request places with the best reception. Campsite has 83 pitches, all bounded and numbered, which are of three types: normal inner, sea view and half pitch. All pitches have 6 Amp. electric hook-up facility with CEI socket, in accordance with EEC directives. Normal pitches and half pitches (perfect for small tents) are situated in the vegetation, at most 60 mt from exit at the beach. Just a limited number of pitches can be booked. Car has to be parked onto the pitch. Our bungalows “natura” are small houses in wood with finishing touches are really painstaking, they respect environment with their energy conservation system, they have also hot water and air conditioning/heating (extra charge). The bungalow for 4 people (about 22 sq. m.) consisting of a bedroom, an equipped kitchenette, a living room/bedroom and a toilette equipped with WC, washbasin, bidet, shower. In the bedroom there is a double bed, while in the living room there is a comfortable sofa bed, or a reclining bunk bed. Kitchenette is equipped with gas cooker, fridge, sink and cupboard with kitchenware (pots, plates, glasses, cutlery, etc.). Outside the bungalows there’s a covered terrace (about 10/12 sq. m.), which offers the chance to relax or eat in open air with table and seats. Parking is nearby the bungalow. Into the bungalows domestic animals are not allowed. Our bungalows “free” are comfortable small houses in masonry, perfect for a relaxing holiday. Finishing touches are really painstaking and they have air conditioning/heating (extra charge). Bungalows “free” respect environment with their energy conservation system and they have also hot water. The bungalows for 4 people (about 30 sq. m.) are also accessible to the handicapped. They consisting in a bedroom with double bed, a bedroom with a reclining bunk bed, a living room, equipped kitchenette and a toilette (wc, washbasin, bidet and shower). Kitchenette is provided with a gas cooker, fridge, sink and cupboard with kitchenware (pots, plates, glasses, cutlery, etc.). Outside the bungalows there’s a covered terrace (about 10 sq. m.), which offers the chance to relax or eat in open air with table and seats. Into the bungalows domestic animals are not allowed. Our bungalows “natura” are small houses in wood with finishing touches are really painstaking, they respect environment with their energy conservation system, they have also hot water and air conditioning/heating (extra charge). The bungalow for 3 people (about 22 sq. m.) consisting of a bedroom, an equipped kitchenette, a living room/bedroom and a toilette equipped with WC, washbasin, bidet, shower. In the bedroom there is a double bed, while in the living room there is a comfortable sofa bed, or a reclining bunk bed. Kitchenette is equipped with gas cooker, fridge, sink and cupboard with kitchenware (pots, plates, glasses, cutlery, etc.). Outside the bungalows there’s a covered terrace (about 10/12 sq. m.), which offers the chance to relax or eat in open air with table and seats. Parking is nearby the bungalow. Into the bungalows domestic animals are not allowed. Campsite has 83 pitches, all bounded and numbered, which are of three types: normal inner, sea view and half pitch. Our buttonholes are 24 pitches with sea view: they’re situated just in front of the beach, with a magnificent view on all the coast of Costa Rei and Peppino rock. Because of their peculiarity, not all pitches sea view are shadowed. All pitches have 6 Amp. (220 Volt) electric hook-up facility with CEI socket, in accordance with EEC directives. Some of the pitches have a 6 Amp electric hook-up. Just a limited number of pitches can be booked. Car has to be parked onto the pitch. Wouldn’t stay in a bungalow again as it just didn’t have the same feel as being in our motorhome. Great few days, was nice to come back and revisit. We stayed here 4 years ago in our camper van on a front row pitch and loved every minute. Bungalow was much smaller than expected and very dark inside. The pictures on the internet were a little deceiving. The kitchen could have been better equipped, particularly a kettle to boil water for tea, we had to use a saucepan. We did ask at reception and the owner did go out of their way to help and found us a coffee machine but we didn’t use it as it was just easier to just continue with the saucepan. Comfortable and cosy for a short break. Everything was so clean and orderly. The staff were very friendly & helpful. We felt so safe and welcome. Everything we needed was at hand. Ground was a bit stony and hard to get pegs in. Would’ve been good to know in advance so we could bring different tent pegs. The pitch was clean and had shade from trees. Plenty space. We had campsites really close to the bungalow. A lot of Germans, with little kids were sometimes so noisy. They talked load and had no respect for keeping distance to other campsites or bungalows. Unser Stellplatz am Meer war genial, Eckplatz mit viel Privatsphäre. Gute Ausgangslage für Ausflüge. Das Babyzimmer mit Wanne - absolut genial! !